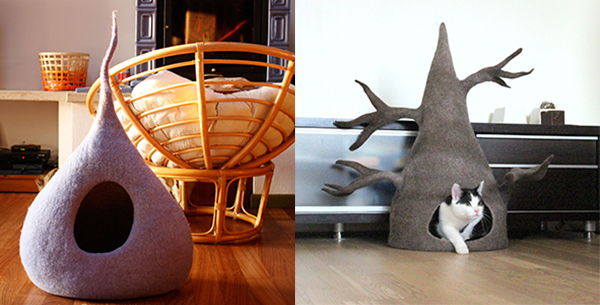 I’m always on the lookout for interesting cat bed designs. I look for styles that would be attractive to cats as well as to cat guardians. I think cat beds should appeal to a cat’s natural instincts and look cool doing it. 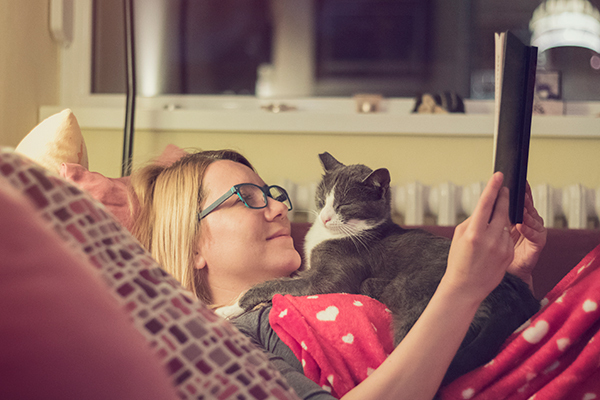 One thing that most cats like is to nestle into a cozy space, somewhere they can get away from the hustle and bustle but still keep an eye on their surroundings. An enclosed cat bed, often called a cocoon bed, can provide just the right space for kitty to curl up and settle in. These types of beds are also sometimes referred to as cat caves, however, in our book Catification, Jackson Galaxy and I make a clear distinction between “cocooning” and “caving,” and this distinction may help you decide if a cocoon-type bed is right for your cat. We define caving as a negative thing, while cocooning is positive. Basically, if your cat is caving she is hiding in fear, trying to become invisible. This is a sign of an unconfident cat, something you most certainly want to avoid. 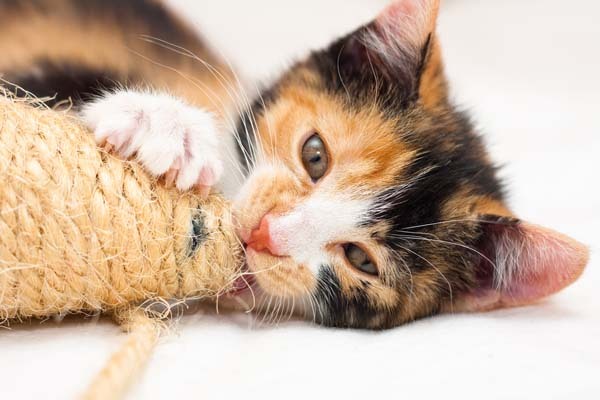 Cats can be found caving under the bed, inside the closet, or in other secluded and sometimes hard-to-reach places. We don’t want that! We want our cats to be confident and social. We want them to be nearby, part of the family, not cowering in fear and hidden away. The opposite of caving is cocooning. This is when a cat chooses to be in a cozy, enclosed or semi-enclosed area, but the difference is that when she’s in the enclosed space, she’s relaxed and confident. Think of a cocoon as a warm, comforting space while a cave is dark, cold, and dreary. Gray felted wool cat cocoons from Kivikis, available on Etsy. Cocoon cat beds can actually be used as a tool to help your cat gain confidence if she is a little skittish or scared. 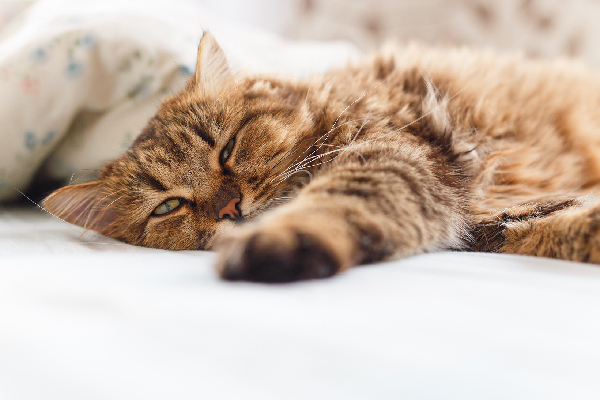 Instead of letting your cat cave under the bed, try blocking off the space under the bed and giving her a comfy cocoon bed. Start by placing the cocoon near the area where your cat was hiding, then slowly over time move the bed little by little out in another part of the house. This way your cat will have a comfortable place to be that’s in a more social area rather than hidden away. 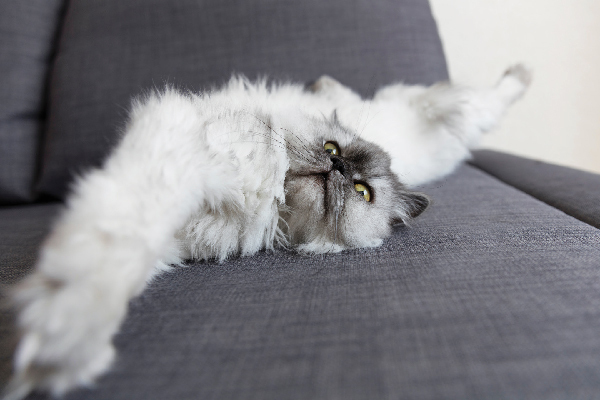 One word of caution: If you have other cats, dogs, or small children who might corner a skittish cat inside an enclosed bed, you will want to look for a cocoon bed that has two openings, or be careful to position the cocoon bed somewhere to avoid this type of confrontation. For example, if you have dog who might try to trap your cat inside the cocoon bed, try placing the bed up high where the dog cannot interfere with kitty entering and exiting the bed. There are many different types of cocoon cat beds, but one that I’ve seen become very popular is the felted wool cat cocoon. Most of these are handcrafted by artisans all over the world, and they are beautiful works of art. The natural wool is a texture that most cats love and the vibrant colors and beautiful designs make lovely decorative accents. 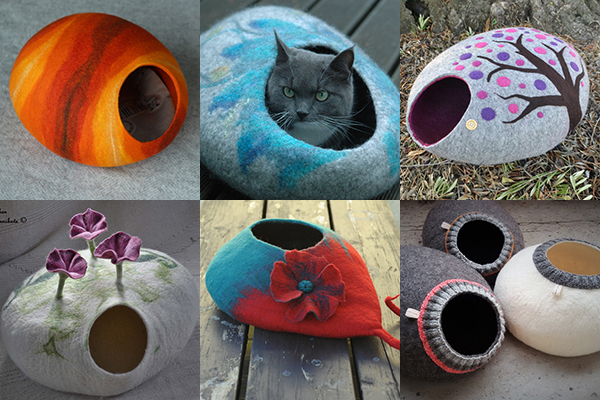 Here are some of my favorite felted wool cat cocoon beds, all available on Etsy. 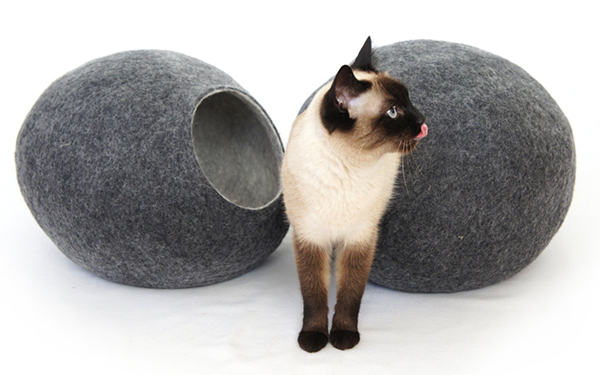 Felted wool cat cocoon beds come in a wide variety of shapes and colors, but basically they are pod-shaped beds. Some are more spherical while others are flatter on the bottom; sizes vary from maker to maker. Some cocoon beds have larger openings and other have small openings. Look for a bed and opening size that is suitable for your cat. Some colorful examples pictured above (left to right): purple-and-white felted cat cocoon from Love Cat Caves in the United Kingdom, $50; ginger wool felt cat cocoon made in Italy by Storow, $56; and purple-and-gray wool felt cat cocoon from Vaivanat in Lithuania, $69. Top row, left to right: a vibrant red-and-orange cocoon bed from Elevele in Lithuania, $74; a grey wool cat cocoon with swirling blue design made in Estonia by Wool4Art, $53; and spring tree design cat cocoon from Batibull in Catalonia, $104. Bottom row, left to right: garden-inspired cat cocoon with three-dimensional flowers from Felt For Cat in Heidelberg, Germany, $250; turquoise-and-red Spanish wool cat cocoon with flower design and a tail from GM Crafts in Ireland, $110; and organic, un-dyed wool cat cocoons adorned with hand-knit details from Kadabros in Lithuania, $63. About the author: Kate Benjamin is the founder of the popular cat style blog Hauspanther.com. She specializes in helping people live stylishly with cats. You may have seen her on Jackson Galaxy’s show My Cat From Hell. Make sure to check out Kate and Jackson’s book, Catification: Designing a Happy and Stylish Home for Your Cat (and You! ).